An air handler, coupled with an evaporator, enables homeowners to distribute cool air through ductwork throughout the home. Air handlers may also be used to distribute heated air. An air handler is an appliance that is sometimes used with a central air conditioning system. Its job is to move air from return ducts across the evaporator coil portion of a split air conditioner, through supply ducts, and to the rooms of your house. Basically it's an electronically controlled blower that's housed in a cabinet with the evaporator coils. The return duct is attached to one end of the air handler and the supply duct to the other end. Some air handlers also include space for an optional electric or hydronic heating coil, enabling them to heat as well as cool. To discover if an air handler is necessary in your home, contact Dr. Energy Saver today! Your local dealer will discuss which products will ensure energy efficiency in your home. The most efficient air handlers have variable speed blower motors that save money in several ways. First, the blower only operates at the speed necessary to meet demand, as called for by the thermostat. Because it generally runs at low speeds with fewer energy-consuming starts, it conserves electricity. Second, starts and stops are "soft," extending the life of your equipment and reducing repair costs. The biggest savings, however, are due to improved cooling efficiency. Instead of frequently shutting down and wasting coolness (standing losses) while waiting for the thermostat's signal to cycle on again, a variable speed blower delivers just enough cool air in a steady stream to meet demand. There are no wasteful surges and shut-downs. Think of it as cruise control for your AC system. It maintains the "speed" (temperature) you desire without wasting "gas" (fuel) on unnecessary acceleration or braking. For occupants, it improves comfort because it eliminates cycles that blast cool air one minute and none the next. In order to save on installation costs, central air conditioning systems are often piggybacked with the existing hot air furnace. This enables them to use the same blower and blower motor as the furnace and the same air distribution system (ductwork). 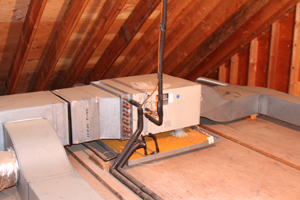 In such cases, it is essential that the evaporator coil be sized correctly for the existing blower and ducts. A coil that is too large, for example, may not have sufficient air flow across the coil, causing it to freeze up. A coil that is too small will not provide the desired degree of cooling and may cause the blower to run constantly. Call us to help you decide about the right equipment for your upgrade. If you need an air handler installed in your home or are interested in having Dr. Energy Saver audit your cooling system, call your local Dr. Energy Saver today. We provide complete solutions for air handlers and all other aspects of your air conditioning system.